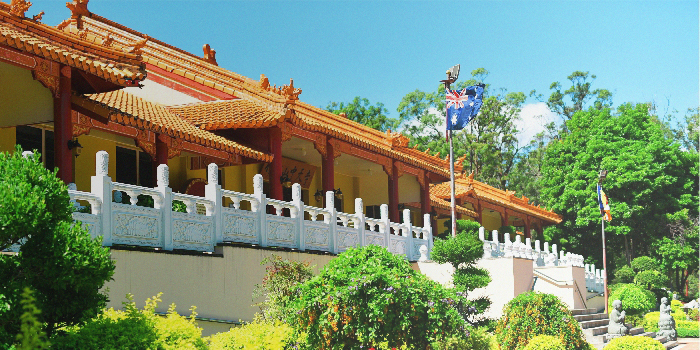 Chung Tian Temple, which means “Middle Heaven”, was constructed in 1992 using traditional Chinese Buddhist architecture – it is situated between Brisbane and Logan, Queensland. Surrounded by nature, the Temple provides a peaceful and culturally beautiful venue for the community to celebrate their multicultural diversity and multi-faith harmony through Humanistic Buddhism. 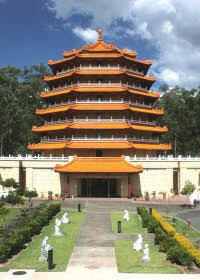 Chung Tian Temple is located at 1034 Underwood Road, Priestdale, Qld 4127. It is a short walk from bus stops. 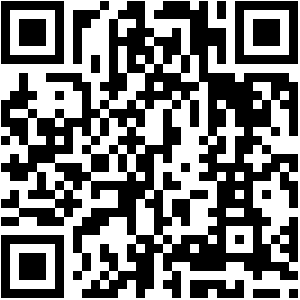 To plan your journey, visit www.translink.com.au or call TransLink on 13 12 30. Take bus route 576, to the stop at Belmore Dr near Kallista Rd, Rochedale South. Walk 20mins to Chung Tian Temple at the end of Underwood Road. (2) From Rochedale South, Eight Mile Plains, Garden City: Take bus route 578, to the stop at Exilis St near Finfoot St, Rochedale South.Walk 15mins to Chung Tian Temple at the end of Underwood Road. 1) Chinese New Year festivals, concerts and Chinese cultural arts performances (classical and contemporary dance, music, arts and choirs). free community event promoting and celebration Buddhism, attracting over 200,000 people (held in first weekend of May annually at South Bank Parklands). 1) Meditation sessions, Buddhist services and Buddhist study classes for the public (beginners to advanced levels, classes held throughout the year). 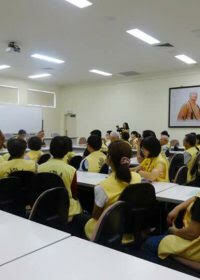 2) Thousands of school students, tourists, dignitaries and the public visit the temple every year. 1) Environmental awareness: planting trees and “Clean Up” days. 2) Charity and fundraising for medical research, children’s toys and natural dissaster appeals etc. The founder of Buddhism, Sakyamuni Buddha, was born into this world. He cultivated himself in this world, attained awakening in this world, and shared with others the deep truths he realized in this world. The human world was emphasized in everything he did. Why did the Buddha attain awakening as a human being? Why did the Buddha attain awakening as a human being, and not as a heavenly being, an asura, an animal, a ghost, or in hell? Taking this question one step further, why did the Buddha not attain awakening in the distant future or the forgotten past? Why did he choose our world and our time? There can only be one reason: the Buddha wanted the teachings of Buddhism to be relevant to the human world. The Buddha’s life as a human being can serve as inspiration and as a model for spiritual practice in our own lives. We call the teachings of the Buddha “Humanistic Buddhism” to emphasize that they can be integrated into all aspects of our daily lives. 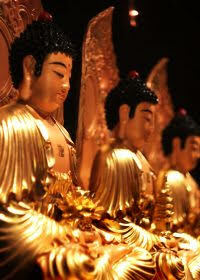 Humanistic Buddhism has six characteristics: 1. Humanity, 2. Emphasis on daily life, 3. Altruism, 4. Joyfulness, 5. Timeliness and 6. Universal. Humanistic Buddhism focuses on integrating spirituality into people’s daily lives and so becomes a ‘practical’ way of living. It is relevant to all aspects of life including relationships, education, environment, culture, economics and politics whilst emphasising personal peace, compassion, family and community harmony. Through Master Hsing Yun’s vision of mutual understanding and peace, the Chung Tian Temple ahs four principles that guides its direction and activities. Dedicated to Avalokitesvara Bodhisattva (Kuan Yin), and the manifestation of compassion within us all. In Chinese the Bodhisattva is known as Kuan Yin. The Bodhisattva has perfect and penetrating hearing to listen to all appeals. Kuan Yin’s manifestations are numerous in both male and female forms. The manifestation depicted in the Hall is the ‘Thousand Hands and Thousand Eyes Kuan Yin’ symbolising an immense capacity to see and help all beings in need. In front of the altar are Dharma instruments: a round wooden fish on the left, a gong on the immediate right with a drum and a bell at the far right. The wooden fish is a wooden block carved with two big eyes and scales. Just as a fish never closes its eyes and is thus always ‘awake,’ one should similarly be acutely aware in earnest dedication to Buddhist practice. These instruments are played by the Monastic’s during services to lead the rhythm of chanting. The displays on the altar represent the Buddhist way of giving and sharing. All offerings are made in admiration for the teachings of the Buddha, not as a form of worship. Offering incense can serve to purify the hall and our mind.ntricate pagodas meticulously made of match-sticks by prisoners, a statue of Sakyamuni Buddha practicing asceticism, items displaying micro-engraving, and replicas of well known Chinese treasures. A Buddhist blessing bell in the temple courtyard. A reminder to herald peace and harmony. 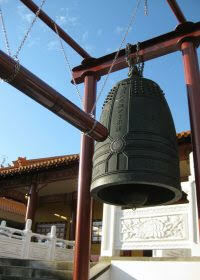 An offering to Buddhist teachings may be made by ringing the large Blessing Bell in the centre court. Cultivate wisdom and induce enlightenment. But vow for attainment of Buddhahood and delivering all sentient beings. The Lotus Treasury World located within the Tea Chan room contains lotus flowers with Buddha statues reminiscent of ‘floating on a sea of fragrant water’ – the world is in the palm of your hand. This area represents Buddha’s world of peace, tranquility, and harmony. There are many lotus flowers, a strong symbol of Buddhism since the exquisite flowers develop from poor beginnings in marshlands. Lotus flowers are reminders that a pure mind may be cultivated within the turmoil of this world. The mirrors at each side of the room reflect the Buddha nature of those who stand before them. Facing the mirrors, numerous images in front and behind are displayed, suggesting the continual cycle of samsara, birth, and rebirth, past lives and future. An additional message is that the present life is not a beginning nor an end but simply a stepping stone to enlightenment. In several profound ways, the room expresses many lessons of Buddhist sutras, including the Law of Cause and Effect and the principle of Dependent Origination. Meditation is the fundamental practice of Buddhism; it promotes peace of mind, clarity in thinking, and the development of wisdom. The Meditation Hall provides space for regular meditation classes and retreats and many individuals engage in personal meditation here. The Hall enshrines Sakyamuni Buddha, the founder of Buddhism. He was born more than 2,500 years ago as a prince in Northern India. To search for the truth of life, he left his privileged life at the age of 29. After six years of meditation and reflection, he achieved enlightenment. His wisdom revealed that all beings are potential Buddhas, each of whom has the ability to reach enlightenment through practicing his teachings. 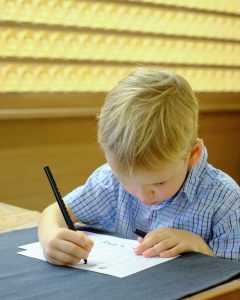 Equipped with traditional and modern Chinese calligraphy material. A great way to experience oriental arts. Buddhism stresses mind cultivation or ‘mindfulness.’ This can be practiced in a variety of ways including formal meditation, chanting, and sutra transcription. While originally the sutras were passed orally, sutra transcription originated in China before printing was invented. At that time hand- copying was required and it was considered that those who carried out this important task gained infinite merits. Nowadays the practice of transcription, also termed writing meditation also assists in purifying the mind by exercising concentration and has become an art form in its own right known as calligraphy. Chinese writing or calligraphy has a rich linguistic meaning and aesthetic beauty. It encapsulates the tradition of more than 5,000 years of the evolution of Chinese characters. Considerable skill is required to write well with brush and ink and even a great calligrapher may take a lifetime to achieve mastery. The conference room can accommodate 120 people. It is equipped with modern faculties and is an ideal of lectures and workshops. The museum houses a substantial collection of Buddha and Bodhisattva statues, Dharma instruments, Chinese calligraphic works, paintings, crafts and other Asian artifacts. It displays a wide range of beautiful Chinese arts and artifacts including Buddha and Bodhisattva statues from regions such as China, Thailand, Sri Lanka and Tibet. The fact that Buddhism has long been blended with local cultures in different areas is well illustrated by the facial resemblance of the statues to the people in the regions where they were made. 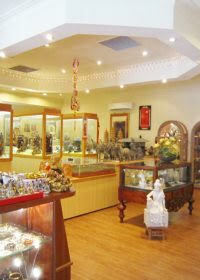 There is also a souvenir shop which sells chanting beads, incense, candles, Buddhist books, CDs, and various other items. Other attractions include intricate pagodas meticulously made of matchsticks by prisoners, a statue of Sakyamuni Buddha practicing asceticism, items displaying micro-engraving, and replicas of well-known Chinese treasures. The Art Gallery aims at exhibitions of different kinds of arts and masterpieces, and showcasing artworks and collections with cultural and artistic value, both from local and overseas artists, to bring Eastern and Western cultures together to raise the cultural awareness in the community through art, both traditional and contemporary. “Repaying droplets of kindness with springs of gratitude”. A drop of water can nurture countless lives. The Teahouse provides visitors tranquil and comfortable surroundings to relax with light vegetarian meals and refreshments. The art of tea is a cultural activity involving the ceremonial preparation and presentation of tea. 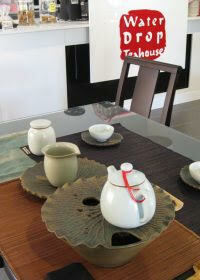 Buddhism combines the tea ceremony with meditation often known as Tea Chan. 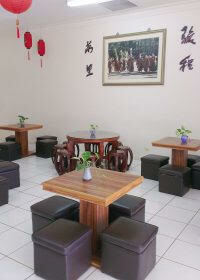 Chung Tian Temple has a special tea Chan room to welcome visitors where tea is served. 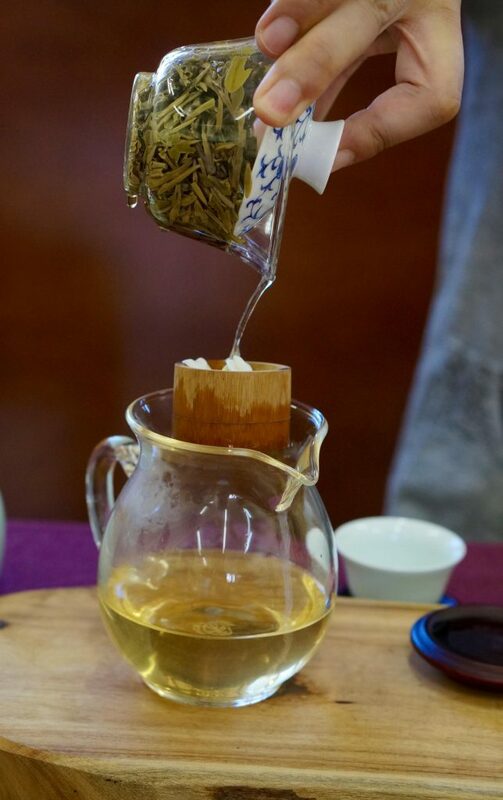 The Chinese Tea Ceremony is conducted for tour groups as part of a familiarization with Chinese culture as well as a means of meditation and respect for others. The Chinese were the first to discover tea leaves. They were also the first to make drinking of tea an art form. Tea was known to be consumed in China as early as the 9th century BC. During the Spring and Autumn Period, people ate fresh tea leaves as vegetables. With the popularization of Buddhism from the Three Kingdoms to the Northern and Southern Dynasties, tea’s refreshing effect made it a favorite among monks in Za-Zou meditation. In the 8th century AD, tea was introduced into Japan by Buddhist monks as a means of keeping awake during meditation. The Tea Room is intended to provide a peaceful haven for visitors having a cup of tea. Visitors are invited to help themselves to refreshment and/or to sit quietly with friends to reflect on the beauty of the Temple. Set amongst the natural surroundings and with its traditional Chinese design is a peaceful and beautiful place to have a memorial to loved ones. Visitors are welcome to pay respects and make offerings of incense flowers, candles and fruit. Opened in 2007 by Venerable Master Hsing Yun who described it as helping to create the Pure Land in Australia, the Pagoda has seen many visitors who come to admire the Seven Level building. The Pagoda has three halls. The Centre has a large Amitabha statue and represents the Pure Land. The ceiling with its Eight Celestial Beings conveys the ideal beauty of the Pure Land. 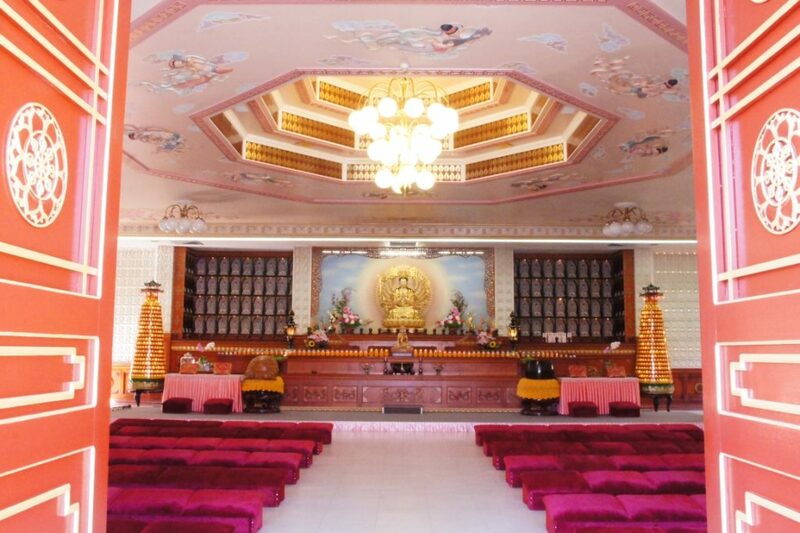 The Western Hall has Amitabha Buddha seated on the Lotus throne. This hall is used for memorial services and to pay respects to ancestors and family. 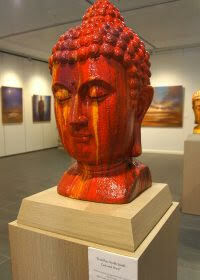 Around the walls are ceramic plaques of Amitabha Buddha that can be purchased as a memorial. The Eastern Hall has Ksitigarbha Bodhisattva – The Bodhisattva of Great Vows reminding us of our practice to keep vows and the Bodhisattva practice to help others. His vow was “Not until Hell is vacant shall I become a Buddha”. The walls are lined with plaques of Ksitigarbha Bodhisattva. Traditional Chinese gardens surround the temple with sculptured landscapes and plants. Gardens contain statuary and plants chosen to create a peaceful ambiance while the presence of a Bodhi tree is indicative of the place at which the Buddha found enlightenment. Eighteen majestic Arhat statues are placed in the Garden Area. An Arhat is a being who has traversed the Noble Eightfold Path and transcended samsara (the cycle of rebirth). Arhats are said to remain in this world to protect the Dharma (Buddhist teachings). They are often represented as possessing various kinds of supernatural power, symbolized either by objects held in their hands or by wild animals crouching submissively beside them. 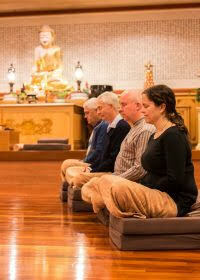 The Venerable maintain a peaceful ambiance and conduct daily services with the chanting of Amitabha Buddha’s name. Visitors are welcome to pay respects and make offerings of incense, flowers, candles and fruit. During Dharma functions, the chanting merits are transferred to the deceased.